Enrolling is a One Time event that assigns your Passfaces and takes you through a process that helps you recognize and retain your Passfaces. The entire process should take about 5 minutes. It MUST be completed in its entirety for Passfaces to work for you. The process takes place in 4 steps. During introduction you are assigned a random set of 3 Passfaces. These 3 faces are your secret code for logging onto your account. You are next shown each face individually and asked to study the face. Take a close look at each one as you would an important person you are meeting for the first time. During the practice session each secret face is presented in a 3 by 3 grid with 8 decoy faces. 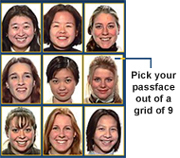 You are asked to pick your secret face from the grid of 9. This happens 3 times, once for each face. Throughout the practice session you are given hints to help you get used to identifying your Passfaces. By the time you have successfully completed the practice session you should be ready to log on using Passfaces. To be sure, you are taken though 2 practice log on sessions. If you need additional practice, you are prompted by the system. Otherwise you have successfully completed enrollment and should not have to repeat the process in the future. The final step in using Passfaces is to actually log on to your account within a few days of enrolling. THIS IS IMPORTANT. Using Passfaces is the best way to assure you will never forget them.